Conil de la Frontera in Andalucia, has been appointed on countless occasions as one of the most loved destinations by tourists. This typical white fishing village, with narrow streets and Andalucian charm is one of the locations with the highest number of beaches in Costa de la Luz. 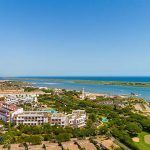 Its 14 kilometres of endless golden sand toasted by the Sun, its pristine beaches, crystal clear waters, the possibilities it offers for water sports and the beautiful natural surroundings place Conil as one of the best places to enjoy the sea. The beaches can be enjoyed throughout the year; from May to October the water is suitable for swimming and the rest of the time they are perfect for surfing and diving. And when the levant wind comes, the coves are the best place to take shelter. 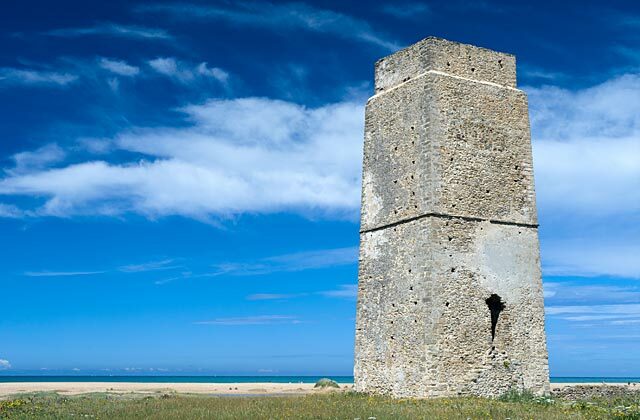 Castilnovo Beach is one of the few virgin beaches of Spain found near a town as tourist-oriented as Conil. It is 2,600 metres long and 180 metres wide with golden sands and it does not have an esplanade. It is a completely natural place with not many inhabitants as there is no parking, so it has to be reached on foot, and reach a point that is near a bus or coach stop and walk from there. Its wave level may be between moderate and windy, as it is very open to the sea, making it ideal for lovers surf lovers. It is common to find nudists in the area. This is the closest to the centre of Conil de la Frontera and therefore is an urban beach with promenade. 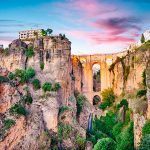 Its proximity to the city has not prevented the area to keep a wild and natural aspect, in fact every year it is awarded with the Blue Flag of quality. Like Fontanilla it also has the ISO 14001 Environmental Certification and the Q for Quality Tourism. It is a 850 meters long and 130 wide sandy beach, with moderate and windy swell, therefore offering a good opportunity to practise water sports. Its location in the village makes it easily accessible and available to all swimming services such as rental of sunbeds, parking and disabled access. 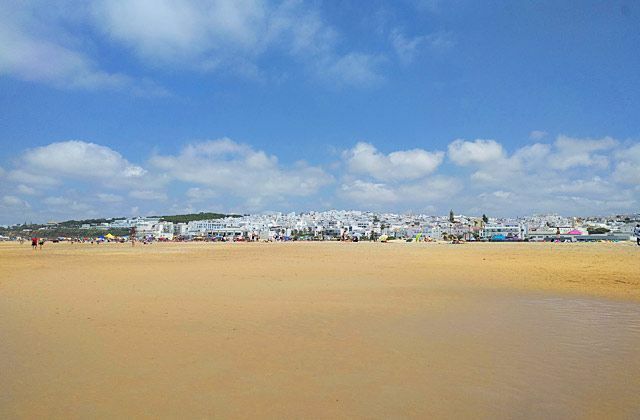 The Fontanilla beach is certainly the best beach in Conil and this is proven by the 14,001 Environmental Certification and Quality Tourism Q awards. This is known by the tourists so the area is always crowded. During high season they occupy its 1,200 meters long and 40 metres wide, but because of its large dimensions, tourists do not feel uncomfortable because of being next to each other. Fontanilla does have a promenade, which starts in the village of Conil. It has moderate and windy waves, but currents and shallow. This makes it ideal for families with children. 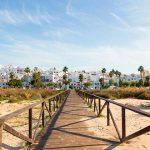 It also has bars and hammocks to rent, some of the most famous bars in Conil de la Frontera are there, such as the restaurant ‘La Fontanilla’, which serves good seafood. Bear in mind that parking spaces aren’t always free because as we said is the area one of the most frequented by tourists and locals, so it is better come early in the morning. It has access for disabled people. Like the rest of them this is a natural beach, traversed by a cliff without promenade. It extends for 1,000 meters and is 25 meters wide. 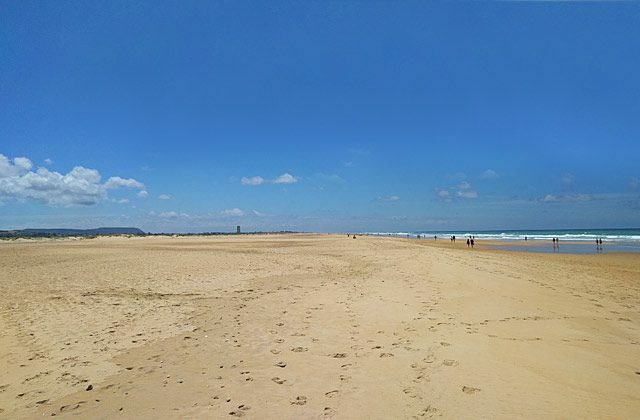 This is the last extensive beach along Conil (the rest of the beaches starting from this one are coves located towards Roche). Its occupation ranks average. Its sand and waves are also moderate, making it a good place to practise surf. It is easily accessible by car or on foot and it has parking spaces available. 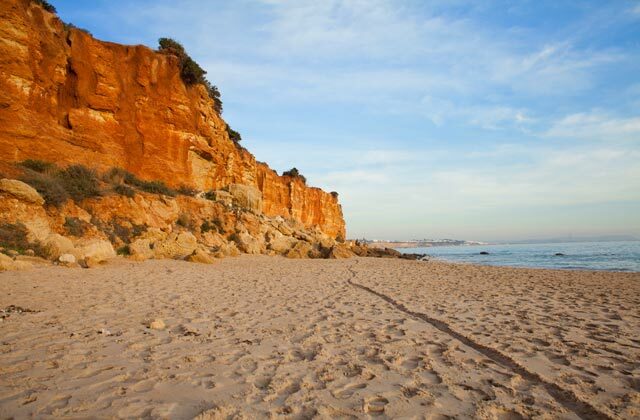 Due to the abrupt cliffs and its sand beach it is perfect for walks at dusk to enjoy a naturally beautiful scenery. It is usually protected against the Levant wind, although when the tide is hard the beach almost disappears. Nudists and naturists find this beach perfect. It is a secluded but easily accessible area, which can be reached by bus and has average occupancy. Like the other coves, the swell is moderate and includes other smaller and secluded coves where the sand is always golden. 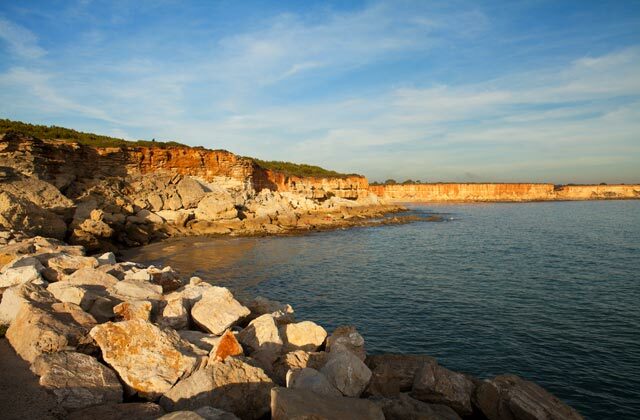 In the case of Calas del Quinto, it comprises three natural coves: Cala Pitones, Cala Sudario and Cala Merchor. 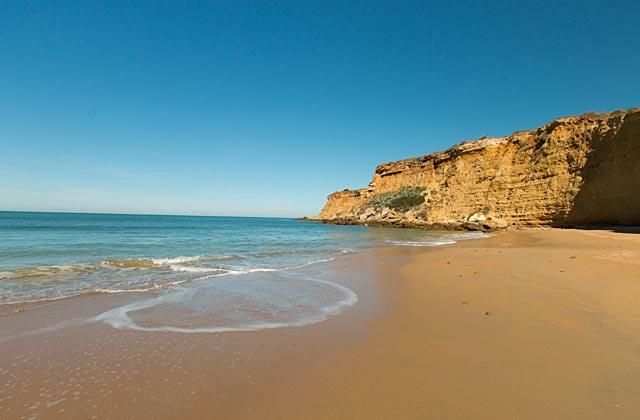 This is one of the most popular beaches in Conil de la Frontera, although it is considered a cove and is more than 450 meters long and 25 meters wide, with fine golden sand and crystal clear waters. It has a moderate swell, and as its name suggests, the water here is a millpond, ideal for enjoying the Atlantic ocean peacefully. It is sheltered from the wind by the surrounding cliffs, which can be accessed through some stairs. It does not have a promenade, but you can go by bus and it has a parking lot and showers. This beach has medium to low occupancy. It is 600 meters long and 20 wide, spread in different small coves. 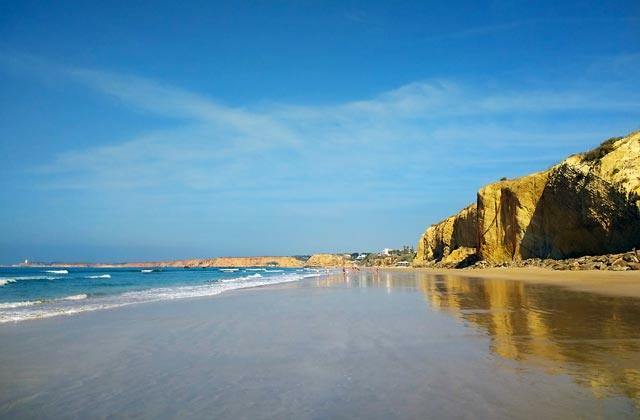 Its waves are moderate and the area includes spectacular coves such as Cala Frailecillo, Cala Medina, Cala Pato and Cala Encendida, all connected when the tide is low. These are rocky beaches under impressive reddish cliffs. Access on foot is quite complicated in some cases, most through steps carved into the rock. To leave the car it is better to use some of the car parks located on the road that communicates Conil with the urbanization of Roche, from there we need to walk for a few minutes along a walkway to access the various coves. Be careful with the paths along the cliffs. This area is perfect for a cycling tour like the one propose in this post. This is a magnificent beach more than 2 kilometres long and 40 meters wide, located next to Cala Encendida, which is separated by a headland. It has average occupation and no boardwalk, but can be reached either by bus or car if it is left in the parking lot. 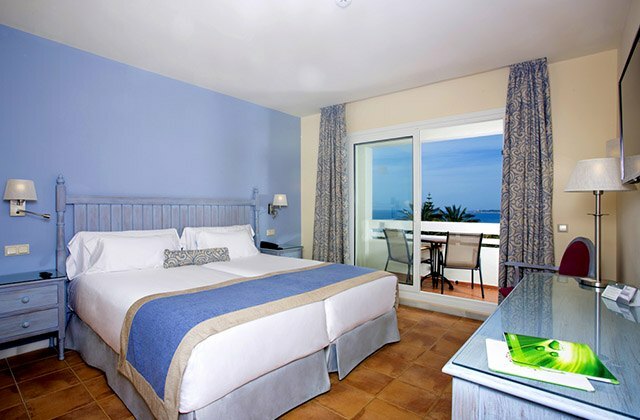 Its golden sand and crystal clear waters have earned the Blue Flag, which certifies its quality. The wave currents are moderate. However it does not have equipment and services. 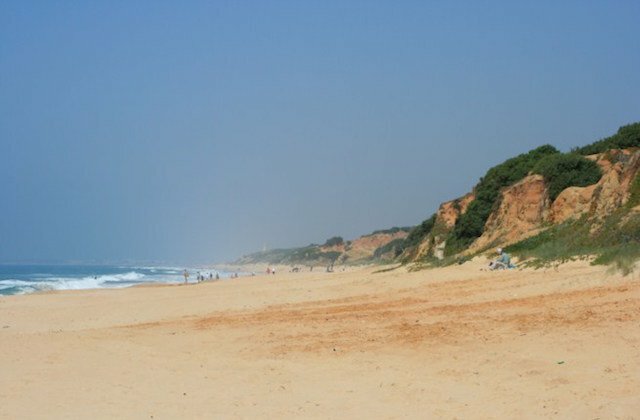 It is a very quiet beach where residents often go to the village of Roche. 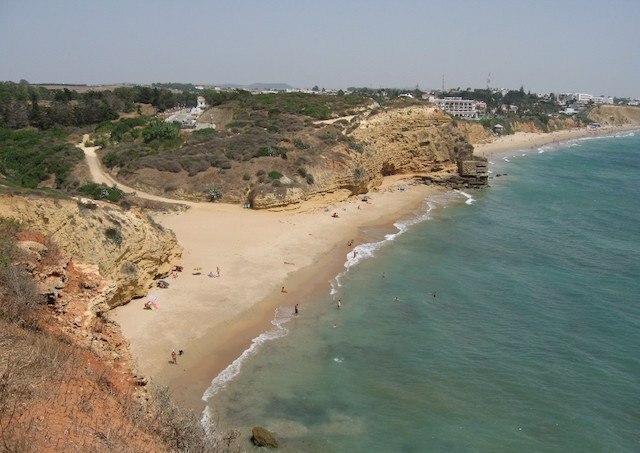 This is the last cove of Conil de la Frontera. 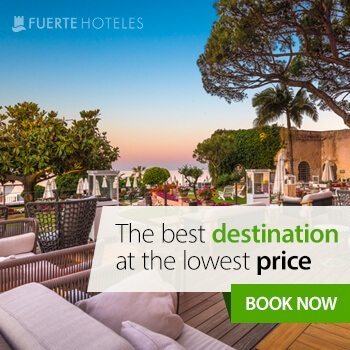 If you really want to enjoy the beaches of Conil de la Frontera, your perfect place is Hotel Fuerte Conil-Costa Luz, facing one of the most beautiful beaches of Spain, La Fontanilla and only 10 minute walk from the centre of Conil de la Frontera. 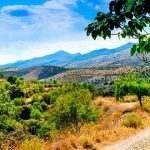 This is an exclusive Andalucian-style hotel with almost 25,000 m2 of gardens, where you can take part in workshops, visits and free bike routes organized to the Roche coves, among other activities.